Springfield plate - 8¾" (222 mm) square. 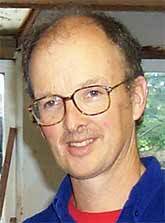 Philip Leach, son of Michael Leach and grandson of Bernard Leach learnt to pot from his father. After working abroad for a number of years he returned to England, married and set up Springfield Pottery at Hartland in Devon where he pots with his wife, Frannie Leach. 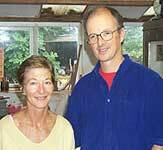 Springfield Pottery was set up in 1979 by Philip and Frannie Leach at Hartland, North Devon. 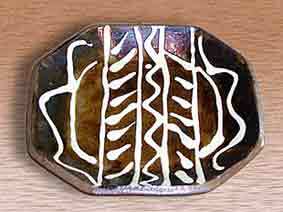 Philip is the son of Michael Leach and the grandson of Bernard Leach. He trained under his father and from 1970 spent six years in Iran where he was involved in setting up student workshops. On his return to Devon he worked with Clive Bowen. Frannie was brought up in the Bahamas. She also trained under Michael Leach at Yelland Pottery and became his assistant. The couple married in 1977. They work in earthenware with slip decoration. Frannie often uses sponges cut to shapes to apply coloured slip, sometimes giving the patterns outlines. The pottery has exhibited widely and their recent successes include Matsumoto, Japan. Visit the Springfield Pottery web site.